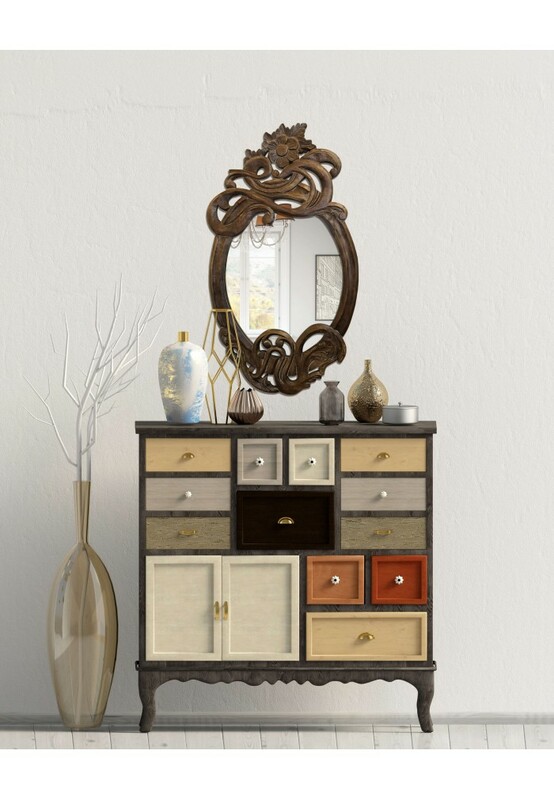 The wonders of Modern Decorative Arts are captured with extreme artisanal skill in DecorShore’s newest addition to our luxury lineup of designer wall mirrors. Each exotic Mango Wood frame is hand-carved into an Art Nouveau Masterpiece with its whiplash curves and flowing, natural lines representing organic, botanical imagery. The hand-jointed carving is an evident work of an artist, no machine can create such unique carvings. Starting with a rectangular block of frame, our wood-working artisans carefully sculpt each linear contour to create the Japanese-style ornamental look popularized throughout the U.S. and Europe during the Industrial Revolution. Along with the great style influencers of the time; Van Gogh, Klimt, Gauguin, & Hector Guimard, this distinctive period at the end of the Arts and Crafts movement produced some of the most unique designs in a distinctive style that is recognizable ‘round the globe despite its relatively brief period of production as a handcrafted art-form. The Art Nouveau style quickly became fashionable for production in textiles, wallpapers, art-prints & posters. These items, as opposed to sculptures & wood-workings, could be produced quickly, en masse. Finer artistic productions became too costly due to the extraordinary effort involved in creating such fine home furnishings. With such extravagant designs and attention to detail, such beautiful home decor became too expensive in an era that quickly gave way to mass production manufacturing via machine. Rarely available antique designs have been thoughtfully recreated and presented in the tradition of high-quality hand-craftsmanship. Each piece takes over 20 hours to fully complete and is extremely limited in availability. 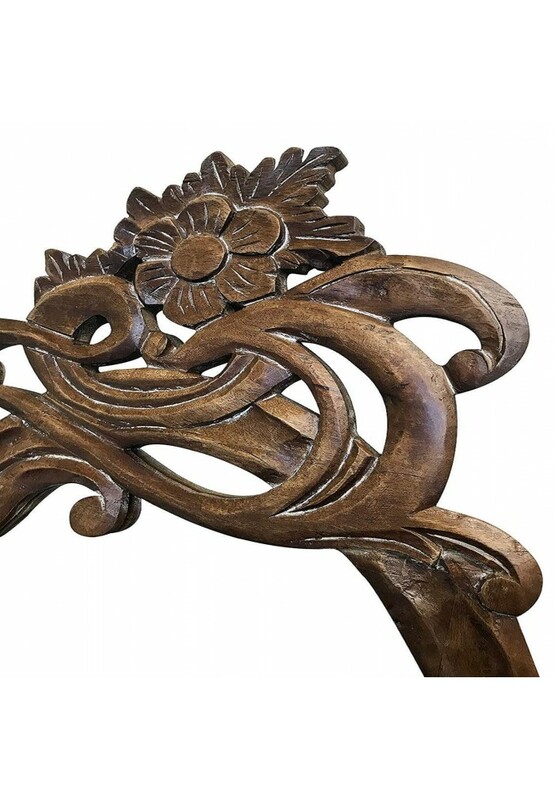 Art Nouveau Masterpiece with its whiplash curves and flowing, natural lines featuring floral & botanical themes. 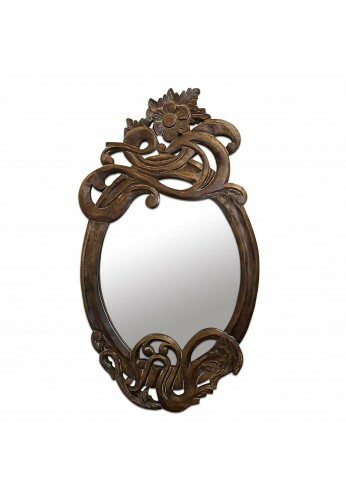 32"x18.5" frame features 19" x 15" mirror and is perfect for use an over the mantel mirror, over a console table, replacement vanity table mirror, in the bathroom or powder room, entryway centerpiece and more. Delicate Hand Carving Care: - dust with a microfiber cloth when necessary. Do not spray glass cleaner directly onto surface. Use a dry microfiber cloth or apply glass cleaner directly to microfiber cloth to clean spots and dirt.